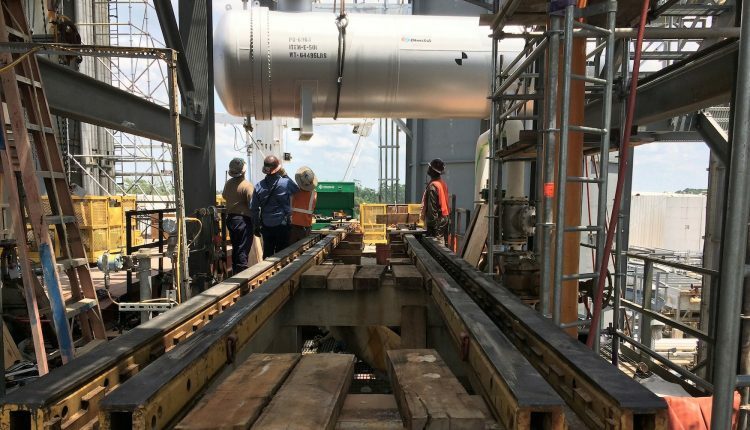 B&G Crane Service LLC utilized a 300-ton capacity Hydra-Slide HT300 heavy-track hydraulic skidding system and other equipment to remove and replace two heat exchanger units for a project in Calcasieu, Louisiana recently. The full scope of work included removal and replacement of five exchangers; two were atop a 51 ft.-high structure elevation and removed by crane, while the smallest unit was moved using skates. The HT300 was used to slide the old exchangers, weighing 49,000 lbs. and 59,000 lbs., a distance of 60 ft. before repeating the process in reverse with the replacement units that weighed 58,000 lbs. and 66,000 lbs. The standard HT300 package comes complete with load-bearing track, four skid shoes, push cylinders and all connecting hardware. The load-moving solution needs minimal clearance and has a total height of only 7 in. (180mm). Additional skid track sections were supplied by Hydra-Slide on short notice to extend the 50 ft. of double track that B&G had available. They connect with a simple lug and pin set and could have been leap-frogged to slide longer distances, if a requirement arose. The equipment combined with other lifting technologies, including two Liebherr mobile cranes—a 100t capacity five-axle LTM 1100-5.2 and a 500t capacity eight-axle LTM 1500-8.1. B&G also utilized a J&R Engineering Lift-n-Lock 1400 series hydraulic gantry and two Scheurle self-propelled modular transporters (SPMT), of six and 12 lines respectively. Extra safety measures were implemented in the planning stages to allow for elevated work on false work platforms, which were essentially barge ramps created by fabricating hand rails to OSHA specifications. Morris explained that the solution prevented potential fall and drop-related accidents from height.